alaTest has collected and analyzed 29 reviews of Kodak Pixpro SPZ1. The average rating for this product is 3.6/5, compared to an average rating of 4.0/5 for other Camcorders for all reviews. Reviewers really like the durability and portability. The price and usability also get good reviews. We analyzed user and expert ratings, product age and more factors. 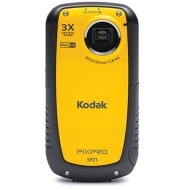 Compared to other Camcorders the Kodak Pixpro SPZ1 is awarded an overall alaScore™ of 77/100 = Good quality. alaTest has collected and analyzed 6 user reviews of Kodak Pixpro SPZ1 from Amazon.com. The average user rating for this product is 3.2/5, compared to an average user rating of 3.9/5 for other Camcorders on Amazon.com. Reviewers are impressed by the reliability. The price also gets good feedback. Many are negative about the image quality. Inferior product - poor sound quality - jerky panning, etc. I previously owned the Samsung HMX-W300, but they have been discontinued. I liked the shape pocket-friendliness of this camera, so order the Kodak Pixpro SPZ1 as a replacement when the Samsung died (water exposure). Great Little Camera! Easy to Use! Great Quality! Fits on tripod. Easy to use. Good sound quality for such a little device.